For Immediate Release: Posted On 1/27/2015 By Industrial Magnetics, Inc.
Industrial Magnetics, Inc. has added a new holding magnet designed for use in paint booths to their family of specialty cup magnets. 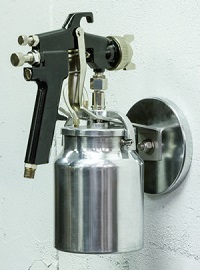 The new Spray Gun Holder has a forked arm that’s capable of holding spray guns in a variety of orientations and a strong neodymium magnet that allows it to attach to any steel surface - even through multiple layers of paint buildup. Designed to keep spray guns, or paint sprayers, orderly and close at hand, the unit can hold up to 95 lbs. and measures 4.9" in diameter and projects out 5.5". For additional information, visit the Specialty Cup Magnets Product Page.